2013 Note: For the most up to date version of this resource list, please visit Dogs In Need of Space here. Living with some DINOS isn’t always easy, but you’re not alone and there is help! Below you’ll find a list of resources gathered from our Facebook fans. This resource guide reflects the tools, trainers, and techniques that have been helpful for their individual DINOS. Every dog is different and there are many types of DINOS, so please keep in mind that what works for one DINOS family, may not work for another. But this list is a great place to start! Please note that being included in this list is not an endorsement by the blog’s author. Please see the DINOS website for the most up to date list, including Books and DVDs! Suzanne Clothier’s classic, “He Just Wants to Say Hi”. Tellington TTouch Methods: based on circular movements of the fingers and hands and using a combination of specific touches, lifts, and movement exercises, TTouch helps to release tension and increase body awareness. For dogs with various behavioral issues, such as fear, aggression, etc. Hilton Herbs: “Tranquility Support” is an herbal calmer that will not dope or sedate your dog, but is reported to help maintain a healthy and balanced nervous system and a calm outlook. Recommend to help with over excitable dogs, rescue animals that may have received bad treatment, or simply tense, nervous sensitive dogs. Healing Touch for Animals: Healing Touch for Animals is a holistic approach designed to support the health and well-being of animals through energy medicine and intention. HTA techniques are reported to restore harmony and balance to the animal’s energy system while providing physical, emotional, mental and instinctual stability. Nose Work for Dogs: also called scent work, this fun activity channels your dog’s natural curiosity and interest in using his nose. This is a terrific activity for reactive or fearful dogs as it can be done one dog at a time and requires no training. An excellent confidence booster. Agility: a fun, mental and physical exercise for dogs that builds teamwork, skills, and confidence. From home-made courses in your own yard to competition trials, agility can be adapted for just about any dog. Dock Diving: is a dog sport in which dogs compete in jumping for distance or height from a dock into a body of water. Dogs jump one at a time and do not need to interact with one another in order to participate. Lure Coursing, Weight Pull, and Disc Dog: three more fun dog sports that can be done without interacting with other dogs! The DINOS Café Press Store! It’s here!! Now you can warn MDIFs off in style! 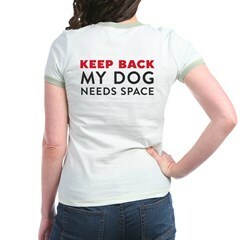 Includes “Keep Back – My Dog Needs Space” gear for you and your dog! “Give Me Space” leash sleeves and bandanas suitable for all dogs, as well as specialty items for blind or deaf dogs in need of space. An Australian company. “Do Not Distract” Vest from Clean Run, includes “do not pet” patch. Great for dogs in training and/or working dogs. Angel Vest: called the “white cane for dogs”, this device is designed to assist blind dogs in feeling things in front of them. Might be useful for blind dogs who needs space, as it provides a slight buffer zone around their face. Caution Badges: a variety of distinct message badges for your leash, custom designs available too, from Bold Lead Designs. Dexil Friendly Dog Collars: collars, harnesses, and leashes with clear, bold messages, such as Caution and No Dogs. Italian Basket Muzzles: flexible, with leather straps and a removable front grill for more access. Dogs can pant, bark, and drink water while wearing. 2013 UPDATE: Check the DINOS website for the most up to date version of this resource guide! ← Soft Serve Dog Poop. Let’s Go There Together. I bought one of those italian basket muzzles years ago when Lacy was on “probation” with animal control..she is a pit bull and got out one day..barked at the neighbors dogs so even though there was no biting..she was required to wear a muzzle in public for a year. My fault she got out..and I don’t blame the neighbor for reacting..but I think it was over kill…anyway. I still have the muzzle and occasionally use it for large dog intro’s, I’ve had it for 6 years..and it wasn’t expensive at all..less than $30 I think. Really durable. And she can pant, drink and take treats with it on..
Wow – that is overkill! I wonder if they would require a muzzle if it had been a different breed? Anyway, thanks for sharing that the muzzle held up for your gal. And those are some good lessons learned! What a great resource!! You have found your calling! Will definitely share on our blog and FB…along with every person with a DINO I know! I love that you included information on Service Dogs here. Because not every dog who needs space, needs space because of fear or anxiety. 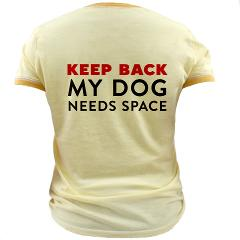 Some dogs need space to do their jobs. Thanks Kit, you’re absolutely right! 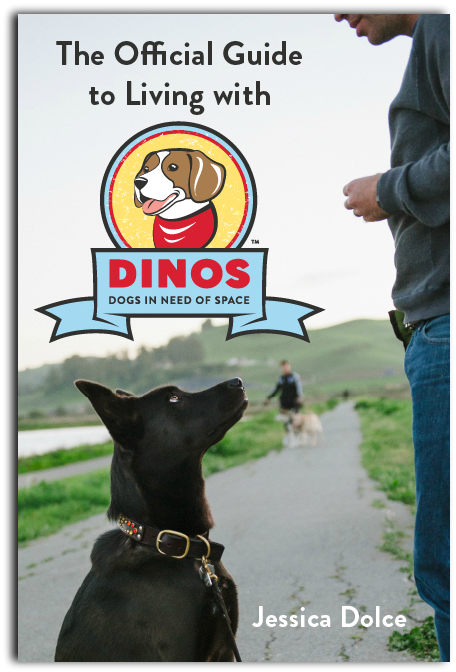 DINOS is for any dog that needs space: to train, to work, to relax, etc. Thanks for reading! We offer offer both a shy souls class & reactive rovers class at Toledo Dog Training. http://www.toledodogtraining.com Keep up the great work & education! Thanks Tonya – I’ll add your classes! The Animal Humane Society (Minnesota) offers Reactive Rovers classes at their Golden Valley location, and I’m pretty sure their Now Boarding and Woodbury locations as well. MARS (Midwest Animal Rescue & Services) has an agility class just for DINOS! MassDOG members have been interviewed in some excellent press coverage of the off leash recreation issue, for example, on WBUR 90. The products that Dexil Friendly Dog Collars do are the BEST for this type of problem. 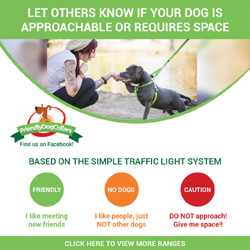 I’m hearing from many people in different countries that they are being seen around a lot, if this can be a worldwide system then all would know what dogs not to approach. A truly fantastic idea that will prevent a lot of harm to children, adults and other dogs.